GATE 2019 Application Form has been started from 1st September 2018. Check here application form details. GATE 2019 Application Form Correction had to be started from 24th September 2018. Due to some unavoidable reasons, Now it is starting from 27th September 2018. Check here for application form correction details. 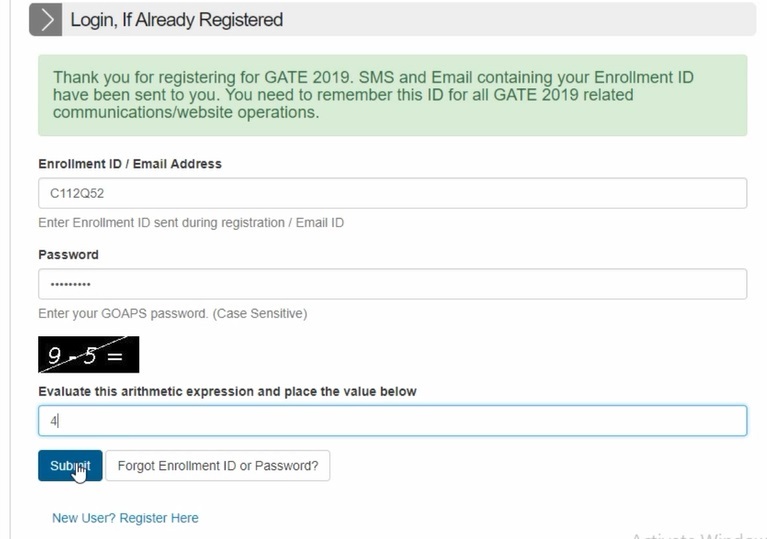 GATE 2019 registration will be done through GOAPS (GATE Online Application Processing System) portal. The registration has been started from 1st September 2018 through online mode. Candidates will fill the application form till 21st September 2018. There is no offline mode to fill the application. With late fee, candidates can register for the exam till 1st October 2018. There is no need to send application or any other documents to the authority by post or any other mode. Personal details (name, date of birth, personal mobile number, parents’ name, parents’ mobile number, etc.). Please note that the name of the candidate in the application form must exactly be the same as that in the qualifying degree certificate or the certificate issued by the Head of the Department/Institute in which the candidate is pursuing his/her study. GATE 2019 scorecard will be issued as per the name entered in the application form. Prefix/title such as Mr/Shri/Dr/Mrs/Smt, etc. should NOT be used before name. College name and address with PIN code. Choice of GATE examination cities. High quality image of candidate’s photograph conforming to the requirements specified. Good quality image of candidate’s signature conforming to the requirements specified. Scanned copy of the Eligibility Certificate in PDF format (Degree Certificate or Provisional Certificate or Certificate from the Head of the Department/ Institute. Scanned copy of Category (SC/ST) certificate (if applicable) in PDF format. Scanned copy of PwD Certificate (if applicable) in PDF format. Scanned copy of Dyslexic Certificate (if applicable) in PDF format. Details of the valid Identity Document* (ID) (The same ID, in original, should be carried to the examination hall). 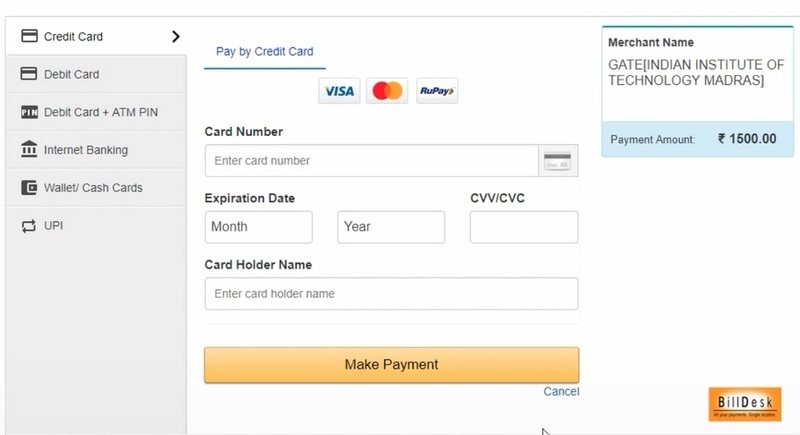 Net-banking/debit card/credit card details for fee payment. Valid Identity Document: Passport/ PAN card/ Voter ID/ Aadhaar-UID/ College ID/ Employee ID/ Driving License. Click here to check GATE 2019 Registration Flow Chart. Access the official link of GOAPS. Click on “Register Here” link. Enter registration details like name of candidate, valid email address, mobile number and a GOAPS password (enter strong password of your choice). Due to last minute rush, the mandatory verification of email and mobile number (before submitting the GATE application form) is relaxed. After the successful registration, candidates will receive GOAPS Enrollment ID on their registered email ID & mobile number. Keep this enrollment ID safe as it will be required for future logins at the time of downloading of admit card, result and score card. Now, candidates have to login with Enrollment ID/Email Address & Password. 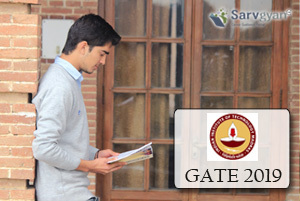 Now, click on “Start GATE 2019 Application Form”. Choose Exam Centres: Students can choose maximum three test centres for taking the examination. Enter Personal Details: Candidates have to enter their personal details including name, date of birth, gender, nationality, ID proof etc. Enter Academic Details: Candidates need to fill their qualification details of degree examination. Enter your Address: Candidates have to enter their complete address including Pin Code for future communication. Draw a rectangular box of size 2 cm × 7 cm (Height x Width) on A4 size white paper. Now, sign using black or dark blue ink pen within this box. The height or width of the signature should be at least 80% of the respective height or width of the rectangular box. Scan the rectangular box containing your signature and save it in JPEG format. The maximum pixel resolution for the image is 160 × 560. The minimum pixel resolution for the image is 80 × 280. Only color photograph taken after 1 August 2018 will be accepted. The photograph should be taken with light or white background. 35% area of photograph should be covered with candidate’ s face. The image should be captured in a standard of 3.5 cm × 4.5 cm (Width x Height) in JPEG format. The maximum pixel resolution for the image is 480 × 640 (0.3 Mega pixel). The minimum pixel resolution for the image is 240 × 320. Mention the source of GATE 2019 information. You can view your filled-in application by clicking on save and view application. Or you can direct submit and proceed to payment. The application fee for Male (General/OBC) and Other candidates is Rs. 1500/- and for SC/ST/Pwd and Women (All Categories) it is Rs. 750/- . The International Students have to pay USD 50 against the application fee. The fee can be paid using net banking, debit card, Credit card, and other online wallets/cash cards. Note: On the successful submission of fee, a “Fee Payment Number” will be generated. Keep this number safe as it is required before the final submission of application form. Before payment, candidates will be shown a ‘preview’ of application. Here, candidates can review and check the application for any errors. After clicking on “Confirm and Final Submit” button, no changes will be allowed at later stages. There is no need to send the print-out of filled-in application form to the GATE office. Click here to view Instructions to Fill GATE 2019 Application Form. If candidates have any query regarding How to Fill GATE 2019 Application Form, they can ask us by commenting below. I finished my b.tech degree this year, and have all semster marksheets but not degree yet. Should i select yes on graduated option and upload any final year mark sheet or select no and upload any final year mark sheet? Confused between yes and no. You should said yes and upload the final semester marksheet. I finished my b.tech degree this year, and have all semster marksheets but not degree yet. Because back in one semester that’s why my degree is not completed yet. Should i select yes on graduated option and upload any final year mark sheet or select no and upload any final year mark sheet? Confused between yes and no. Can i use 8th sem marksheet instead of provisional degree ..i am passed out these year ??? I want to know what documents i need to attach with the form?? It is given on the official website information brochure. I have completed my BE IN 2017. I have my degree certificate is it required to be attested by principal? No, you can apply with degree certificate. The deducted amount will be refunded. i have arrear and haven’t completed my degree..i am 2017 passout. I filled as am not graduates yet but also mentioned my correct graduating year as 2017..is this the right way?? ?..if not, is there any other way??.. My query is about filling the name.I am married and have to fill the form with new name as I have already change my name in Aadhar card,voting card and in gazzet also. But according to the process name should be same as that of 10 the marksheet / degree certificate which are of old name.so pls tell me what should I do for it..? I have done M.sc biotechnology in 2017. Which documents summit in 2018 gate? is it ok to scan the document for gate 2018 using camscanner? If it will be accepted. I PURSUED DIP IN MECH ENGG SO I WAS DIRECTLY JOINED TO 2 YR BTECH SO NOW MY BTECH COURSE IS 3 YEARS …. I HAVE A DIALOMA IN APPLICATION FOR WHETHER I HAVE TO FILL 3 OR 4 YEARS FOR DEGREE COURSE??? 4 year. The nature of this course is four year degree course,. and currently i am pursuing M.Tech in Computer Network Engineering and i am going to complete M.Tech in CNE in 2018 year of pass out (2 years program / Master Degree). And i was bit confused from all this aspects. So, i am sincerely requesting you to please help me out to complete the process and awaiting for your response at the earliest. eligibility certificate means a certified letter from your current college that you are pursing M.tech in CNE and completing it in 2018. written by department head, Dean or Principal. I have provisional degree certificate issued by college but, I dont have pdc issued by university ,is it ok to apply????? 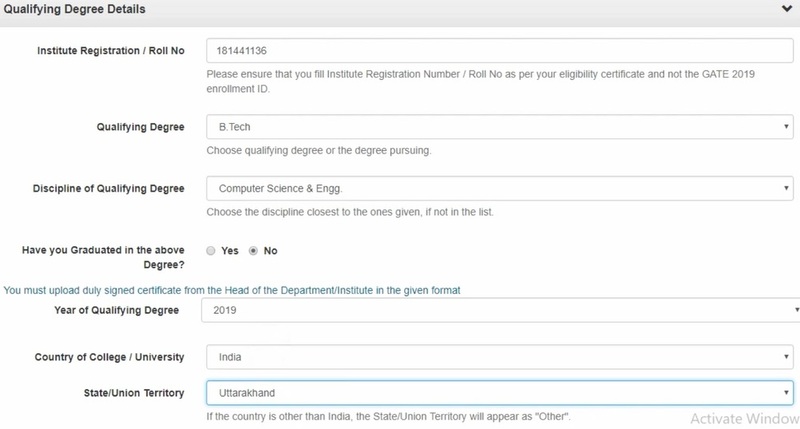 Before getting provisional certificate (if you are pursuing) you need to get a certificate from your college that you are still in this status of eligibility called eligibility certificate. there is option during filling the form of thumb impression? plz answer,Is there any opt.?? Yes there is option to uploading thumb impression. How should we upload the thumbprint?? Are there any specific details we need to follow??? Go to the official information brochure for complete details. I have a provisional degree certificate without my photo, is it okay to upload the same? Yes, you can upload them. I have arrear and haven’t completed my degree…am 2017 passed out. I filled as am not graduated yet and mentioned as will be graduating by 2018…is that the right way???.. there ois no such way to change the option. No. You are not eligible. Hi,I have done my Mtech 2014 and willing to apply Gate 2018 this year. Do I need certificate of HOD. No. This is for the appearing candidates. you can attach your 7th Sem marksheet. Im B.E. student of ECE. I hav 1 kt in 5th sem..can i apply for gate? sir i am completed m.sc in 2017 all semisters are cleared,but provisinal are not come . i have 1st 2nd 3rd sems marks lists and course completed certificate TC . in this certificates any one uploaded. application is accepted are not. sir iam studying 3rd year BTECH,can apply 2018 gate exam. 3rd year passed candidates may apply for GATE. Sir my photobackground is sky(blue) colour and it submitted and also payment and pdf is download.Will my application form be rejected? should be light color, not only sky blue. Images should be in required shape and size. No need to put any info on it. Eligibility certificate can be obtained from your college. See your category in national/central reservation category list. If you comes any of the reservation category heading then you can apply under that category, otherwise you have to fill general category. Should eligibility certificate be same as the given format or can it change slightly?? which document is required for passout student whose result of final semester has not come? sir when the hall ticket will be issued? Get complete information from the official website regarding eligibility certificate. if not the above 2 what is it’s format & dimensions? sir I have a backlog which will be re written with 8th semester of my b.tech course. Am I elligible to gate 2018? during the payment the fees had been debited from my account but the transaction got failed due to the technical errors,so how can I Get my money in refund..,plz help me for this. you should contact the GATE officials. I am not able to uplad pdf file of Pwd certificate.What should be its size? I have submitted the form but in payment option, i am not getting the e-challan option. where it display. please tell me. by mistake i have uploaded my signature into the thumb impression column and i have completed payment ,, IS Thr any problem ???? You will receive email regarding correction of documents uploaded. I have made my payment through e-challan. now do I need to follow any further steps? I have got one confirmation message that payment has been made. And I am also able to download the pdf of my application form. Please guide me in this case. Thanks in advance. you can check the status of application..
Sir I don’t have provisional certificate still now…can I apply for gate 2017..
Download the challan form from the official site and fill it and .submit it towards the prescribed bank. yes it might be used in future. SIR.PRESENTLY I AM IN FINAL YEAR PRODUCTION ENGINEERING.PL.CONVEY THE ELIGIBLE BRANCH CODE TO APPEAR IN THE GATE EXAM 2017. Sir, I submitted my form successfully, even the payment was done successfully.. But, I didn’t receive a conformation email or a message.. How would I consider it as confirmed? you should contact the officials or recheck you mail. How can i contact the officials any mobile number or other number is there? before this click on save button. I did wrong in payment but it shows e-Challan Payment made. Your payment has not yet been received by GATE-2017. Take a printout of the challan and deposit the amount in State Bank of India. Check your payment status after 72 hours of depositing the amount. you can download the degree certificate format, fill it from your college/university and then scan and upload it in the PDF format. The size should be less than 300kb. you can check the detailed steps given in the page, also there is video tutorial for you. What is the format of the documents needed to prove the caste (SC/ST)….?? What is the format of the documents needed to prove the caste….?? i am currently pursuing final year B.E degree can i upload my fifth semester mark sheet as a eligibility certificate? Will i get a job in psu if i got just passed with cut-of marks in gate 2017 under oc from ece. thanku sir for giving all information in proper way. m sure it will help to all GATE aspirant…. Sir I don’t have provisional certificate still now.. but I have course completion certificate and mark sheets can I apply for gate 2017..